Monday, 30 April and I am on a mission to collect bark for more Indigenous canoe projects, this time it will be working with Tribal Warrior Association’s Youth Mentor Group. Getting bark is not a simple ‘go to the shop’ process – it needs permission, planning, and manpower. Paul Carriage Cultural Liaison Officer from Forests NSW (FNSW) and a member of the Ulladulla Local Aboriginal land Council helped provide all three of these things. 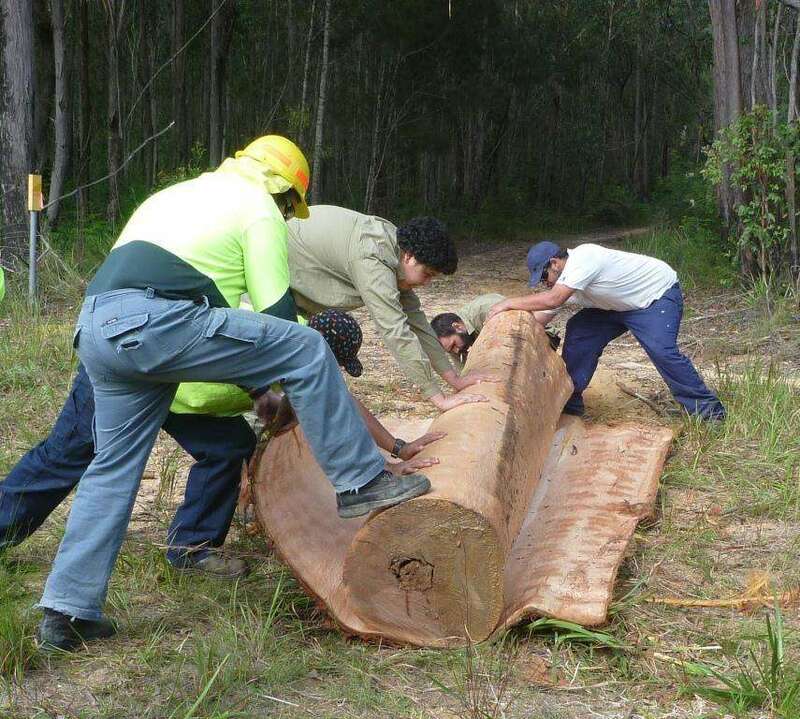 It needs timing too – its best with wet ground that keeps the trees moist so the bark will lift, this came courtesy of El Nino and the rain we have had over the past months. And it needs a day on the road and in the bush. Meeting Paul mid-morning I followed him into the Boyne State Forest about 10 minutes north of Batemans Bay, cruising along the dirt road and pulling off to let the logging trucks through. 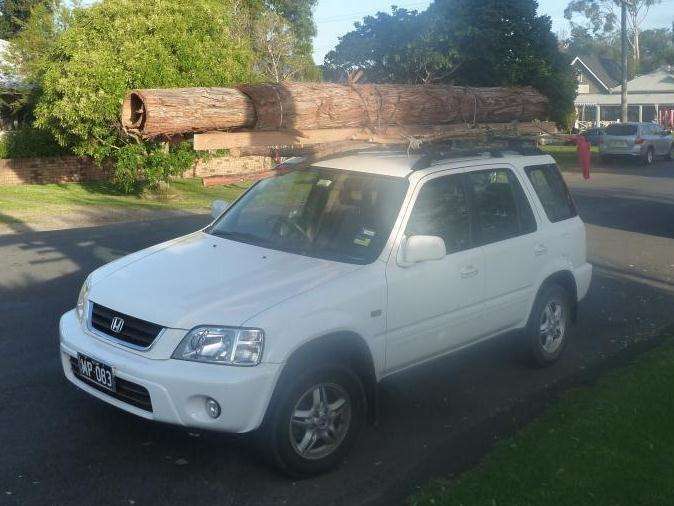 Dave Mills from FNSW was there with his truck, ready to fell and haul out the logs we would need, and Paul’s organisation had rounded up a team of helpers from MogoLALC, including Elder Uncle Tom Butler. 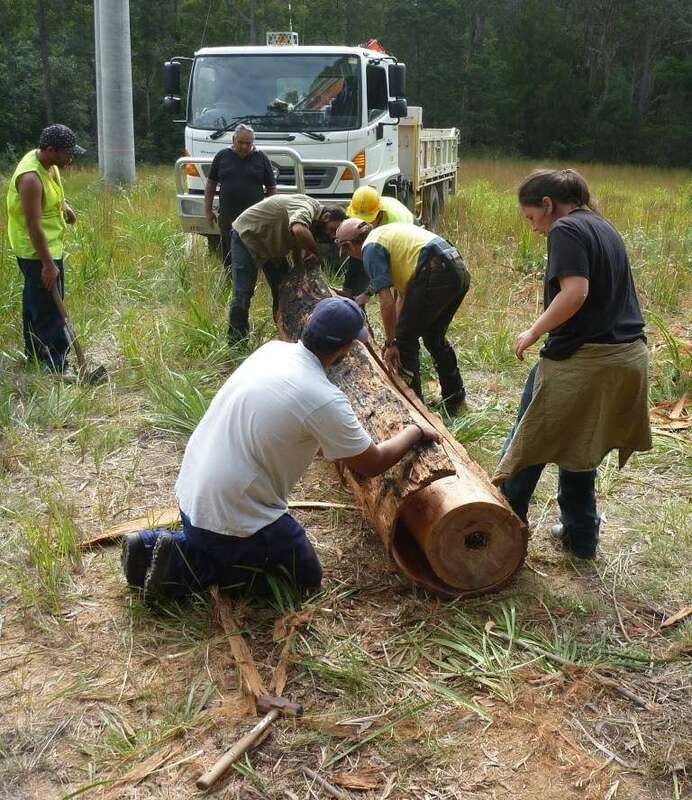 For me it was chance to catch up with Paul, Dave, Uncle Tom, James and Cameron who had been there for the Ulladulla workshop, but there was not much time to socialise after Dave felled the first yellow stringy bark and brought out a four metre long trunk to a clearing down the track. Safety first as Paul noted the rules, and then cut a slit down the bark on the trunk. Next Paul showed us how to pound the bark with the back of an axe. This made the bark spring off the hard, woody interior, and if the timing is right and the tree is moist, it comes off with relatively ease. For us we were in luck, each big hit saw a patch lift, you could feel and see it bounce up, and tapping it gave a hollow sound, so we knew where it needed an extra hit. 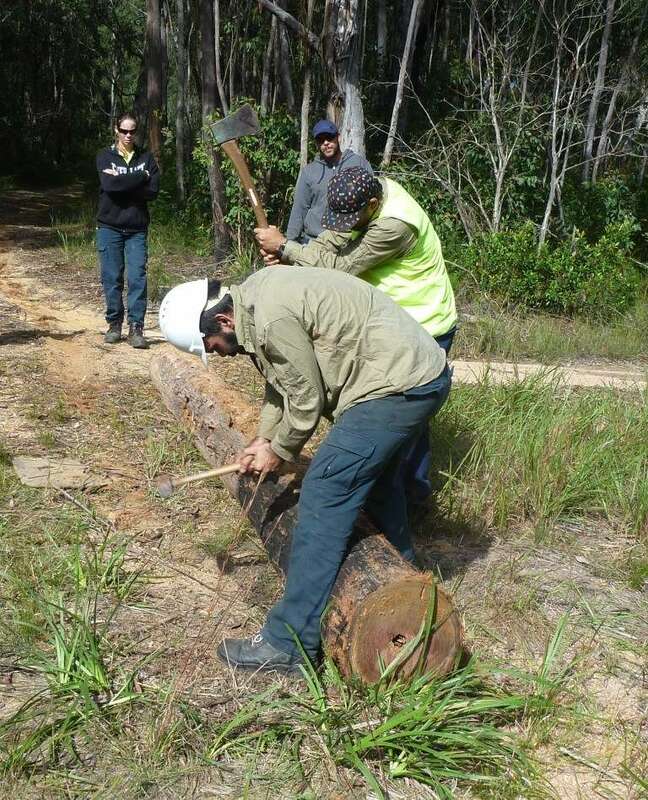 We took turns pounding the bark, easing it off then rolling the log to get to the underside and pound away again. A long pinch bar helped prise it back gently, and helped roll the heavy log. After 10 minutes of heavy axe work and two people working together, we rolled the log out of the bark. This was going much better than anticipated as some of Paul’s previous experience had been measured in hours. Dave felled three more trees, and we had the barks off almost as quickly. 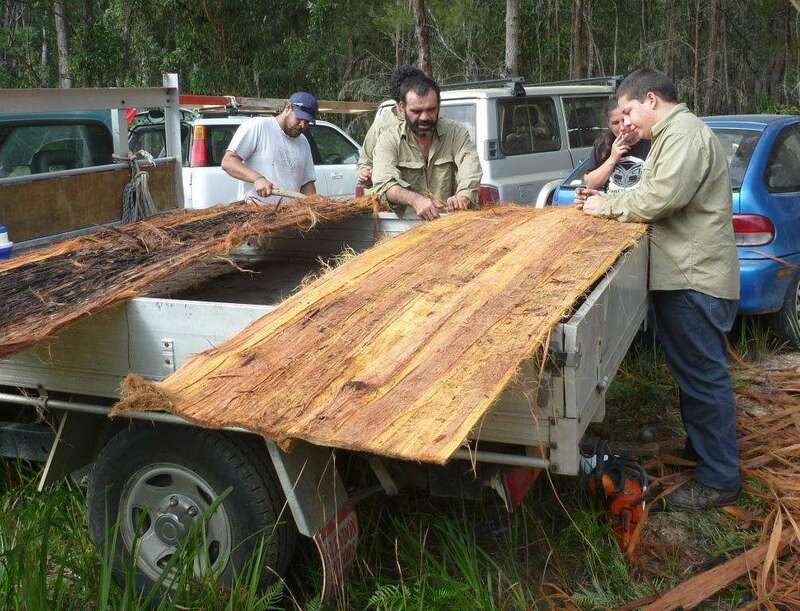 The Mogo team laid their barks out and went straight into peeling off the loose exterior bark that would not be needed on the canoe hull. Meanwhile I rolled up the two I had helped pound off and we strapped them to a frame I had tied to the roof racks. I also collected saplings for branches needed to support the sides, tied them on, and then taped a red shopping bag onto the overhanging limbs. By 2 pm we had cleared out and I was on the Princess Highway heading north, sore but satisfied and looking forward to a coffee in Berry! Soon there should be canoes….. Keep watching this space. David Payne is Curator of Historic Vessels at Australian National Maritime Museum, and through the Australian Register of Historic Vessels he works closely with heritage boat owners throughout Australia researching and advising on their craft and their social connections. David has also been a yacht designer and documented many of the museum’s vessels with extensive drawings. He has had a wide sailing experience, from Lasers and 12-foot skiffs through to long ocean passages.